They're made from greek yogurt, does it get any healthier? You can get yours at Safeway, Tom Thumb, Randalls, whatever they call it in your neck of the woods. At first, I thought I'd just feature the greek yogurt bars and call it good, but I couldn't set the bar so low for myself on our first mystery ingredient, could I? Then I came across this recipe for Cherry Scones that used bing cherries and was based off an ATK recipe. Pretty legit. Later on, Adrienne and I were chatting about scones, the authentic type, like I had in the UK while there for her wedding. Over there, scones are lightly sweetened, buttery and flaky like biscuits almost, maybe with some dried fruit. Here, scones have as varied a texture as all the Irish Soda Bread recipes you've ever come across, sometimes come frosted and while usually still dense have a more crumb like texture. Her thoughts were that Americans put so much stuff in our scones, because we don't have clotted cream here. I'm pretty sure she could be right. Clotted cream is hard to describe, but I'd say it's like spreadable whipping cream, which you might think is the same thing as butter, but it's not. 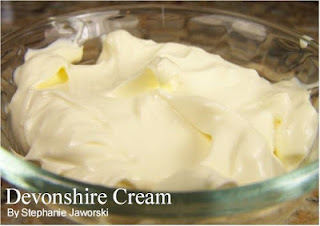 Sometimes called Devonshire Cream, the source link above has a recipe for the making your own, but I decided to try my luck at the fancy-pants version of my regular grocery store, and this was the closest thing I could find. "Product of England" Don't ever plan on this being your regular butter, you'll go bankrupt! Here's where things get complicated, as if I haven't rambled on long enough! Candied cherries, at least here in TX, seem to only be sold around Christmas, because really, when else will you be baking a fruit cake? Never fear, more cooking blogs to the rescue. A quick google of "How to Make Candied Cherries" while in the baking aisle at the grocery store gave me the answer. In case you haven't caught on by now, sometimes, I too "choose the wrench." Once the cherries had been candied and the leftover maraschino juice stored for a rainy day Shirley Temple, the actual making of the scones was pretty straight forward. Even though I definitely made it more complicated than it needed to be, I'm glad I went this route. 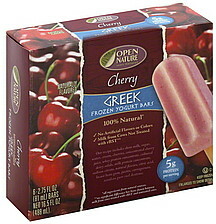 Because really, this kind of cherry is perfect for eating just the way it is! Now go forth and check out the delicious-ness that Jessica and Tasha cooked up. Clafoutis (that's fun to say) was very popular this week! Friends had us over for dessert yesterday, and guess what they served for dessert? If you want to play along, the link-up is at Jessica's, and at the end of Tasha's post, you'll also discover next week's challenge. I already peeked, and I'm excited! If you want to participate but don't have a blog, you could instagram it, #mysteryingredient or use the same hashtag on twitter with a link to your picture. The other option is to post it on facebook and tag one of us, so we can see it! Still cooking up ideas for a graphic. (See what I did there?) Now that the master-genius behind my blog header is back in town, maybe we can get something underway. And just this morning, I learned that he has a subscription to a stock graphics and photos site, score! You made your own candied cherries? Now I need to learn at the feet of the master. And you know Adrienne in real life? Tell her to get back on her blogging! I've been anxiously awaiting news about her move back to the States! WOW!!! Totally blown away, bit it is you, so. I kinda figures it would be up to par as usual! Red dye and shout out made me crack up. The wrench, seriously, Frank does it to, I guess I shouldn't complain because everything you guys make us fanominal! I'm excited to see what y'all "cook up". Really? No candied cherries? Did you look in the cocktail making section? The ice cream topping section? Where do you live? Srsly, I love scones and those look like they would get along very well with my Constant Comment tea.